A director of imaging services shares details about the facility’s radiation dose reduction and monitoring program. 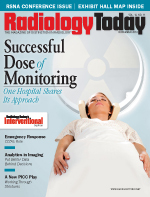 Radiation dose reduction is a growing priority for hospitals and health systems, helping to improve patient safety and satisfaction. In California, where White Memorial Medical Center is located, and several other states, dose monitoring goes beyond best practices and is required by law. • Develop principles that guide current and future technology purchases. • Make dose reduction a priority. • Combine the recommendations of the Image Gently and Image Wisely campaigns with local quality control and quality assurance. Like many hospitals, White Memorial has undergone a vast transformation since 2005; making the transition from analog to digital x-rays has implications and provides opportunities in regards to radiation dose. For example, evolution in direct DR technology expands the use of X-ray as a diagnostic modality with less patient radiation exposure. At White Memorial, the cesium detectors used in Fujifilm’s FDR-Go DR system have enabled dose reductions of more than 50% over the hospital’s previous CR techniques while producing equivalent or improved image quality. A combination of the technology and reeducation of technologists and physicians made such improvements possible. A growing reliance on automation had fostered a gradual abandonment of the basics of patient measurement and the utilization of ideal exposure combinations. By returning to these basics, my colleagues and I have found that the technologists have the tools they need to reduce dose exposure effectively while maintaining image quality and just needed to be trained and supported to inculcate a new culture of patient safety. Like customers in other industries, our patients have become more educated. Internet access and social media aid this process by allowing patients to share experiences with numerous audiences, giving an almost endless reach to the impact of word-of-mouth feedback. Patients’ primary concerns used to be related to cost and access; today’s patients are likely to inquire about the specific technology being used and whether they will receive more ionizing radiation than necessary. In my earlier days working as a technologist, the typical patient response reflected acceptance that the retake must be necessary for the radiologist to make an accurate diagnosis. Today, technologists in this situation are more likely to find themselves explaining exactly why the additional exposure is needed and whether it can be avoided. While some radiology professionals may find this questioning inconvenient, a more informed patient often equates to a more engaged patient, someone who is more likely to aid the technologist and radiologist in ways such as positioning and following exam instructions. This provides an opportunity to provide higher-quality patient care. Differences in technique among digital systems are common and can cause confusion among technologists that results in varying levels of image quality when more than one vendor or type of detector is being used. The image acquisition process differs between vendors, and detector types have disparities in their efficiency. For this reason, a standardized approach to producing consistent, high-quality images must be part of the foundation of our operations. Quality must be assessed based on detector exposure indicator and individual image quality analysis, not factors that can be adjusted during postprocessing, such as image brightness. My facility’s approach to creating imaging standards brought together several members of the radiology team, including the medical director of radiology, outpatient imaging director, lead technologist, and medical physicists. Each modality that utilizes ionizing radiation was issued a protocol book that included radiation safety principles, dose reduction guidelines, and image quality standards. CT units were programmed with these protocols, which cannot be modified without radiologist approval. Management informed staff that, going forward, all departments utilizing ionizing radiation for diagnostic studies would be required to monitor and track patients’ radiation exposure. Based on the facility’s standardized protocols developed and customized to each device, technologists underwent an educational program to help them better understand the principles of dose-limiting imaging. One comparatively new concept we employ is an exposure index, which is a function of body part selected, body part thickness, peak kilovoltage, added filtration in the X-ray beam, and detector type. We also stress the importance of proper positioning, eliminating patient motion, proper collimation, and the appropriate use of grids. We discuss the appropriateness of using automatic exposure control sensors, which often are not calibrated for pediatrics. We use manual techniques for patient exposure control when automatic exposure control is not an option. As mentioned earlier, some of the basic techniques may have gotten lost in the advent of digital imaging, including measuring body part thickness using calipers. Proper collimation was emphasized when developing the guidelines. Collimation limits X-ray exposure to body parts unrelated to a clinical diagnosis, which in turn lowers an exam’s overall dose area. It also reduces scatter radiation to improve image quality. Automated digital image techniques such as postprocessing collimation result in lower image quality at a higher dose. In our view, there is no substitute for applying a technologist’s education and experience in collimating at the outset of an exam. At White Memorial, we felt this was especially important because the hospital is a training site for radiologic technology students. We often say that while some organizations may use the technology instead of the technologist, we use the technology to make the technologist better. • Perform only single scanograms/scout images. • Eliminate bladder-delay scans (except for clinical indications in the urinary tract). • Eliminate with- and without-contrast studies for all body parts (except brains requiring contrast). • Substitute ultrasound or MRI for ionizing radiation modalities where appropriate. • Eliminate multiple-pass abdomen pelvic studies for pediatric patients. • Establish pediatric CT protocols with CT dose index volumes below ACR recommendations. • Require lead shield use in CT imaging in cases where the image would not be affected. • Require shielding for all body parts outside the region of interest. • Use ultrasound to evaluate possible appendicitis prior to ordering a CT scan. Referring physicians and nurses were educated extensively on appropriateness in imaging. Because we sometimes encounter opposition when telling clinicians what exams should or should not be used for a given patient, our management team leverages the Image Gently and Image Wisely campaign materials to educate referrers that appropriateness often is a matter of patient safety, not just a cost issue. As a matter of policy, technologists are required to review patients’ medical records prior to an exam to determine whether an ionizing exam was performed recently. If such an exam was performed within the past two weeks, policy requires the technologist to contact the radiologist who, after consulting with the ordering physician, will determine the most appropriate course of action. Rather than dictate restrictions to clinicians, our team presents alternative approaches to yield the needed diagnostic information, such as doing an ultrasound before a CT for possible appendicitis. Physicians also were encouraged to read images using different phantom models to determine whether they could tell the difference between images acquired at different dose levels. In doing so, we wanted to help clinicians understand that with technologies such as our cesium-detector DR, less dose is required to obtain diagnostic-quality images. Our medical director of emergency services has been a physician champion of this effort, improving its acceptance among physicians outside the radiology department. To reinforce new guidelines and procedures, we implemented a quality control program to assess technologist compliance with the dose reduction initiative. As the facility’s budgets have decreased, technology has replaced some processes that had been performed manually—including duties of a dedicated quality control technologist—and our experience was that some degree of this manual oversight would be necessary to maintain consistent quality. To address this, the radiology services department conducts a semiannual audit of the previous six months’ radiography studies, pulling a total of 20 exams per technologist per year. (Additionally, we currently use similar technologist analysis tools for CT and other ionizing modalities.) In a radiography audit, the PACS administrator draws 10 medical record numbers and 10 corresponding studies, each with the inputs used to administer the exam recorded. The randomly selected X-ray exams are intended to reflect the typical tasks assigned to the technologist being reviewed. Nine areas are graded on each study, with a maximum score of 11.1 points. Any item requiring improvement results in a 1.6-point deduction. The scoring matrix looks at areas under the headings of quality, safety, and accuracy. Technologists whose scores fall below the department’s benchmarks—which are set to increase gradually over time—are subject to one-on-one meetings and in-service training sessions designed to raise their scores on the next evaluation. • Exam performed matches protocol for exam ordered. • Patient positioning was correct/optimal. • Image is free of preventable artifacts. • Exposure was limited to area of interest and properly collimated. • Technique factors and dosage were according to protocol, patient appropriate, and consistent with Image Gently and Image Wisely recommendations. • Patient was shielded wherever possible. • Image was properly marked/identified. • All relevant PACS notes were inputted. • All screening, consent, and other documents were completed and scanned into PACS. The role that the technology selection plays in dose reduction cannot be denied. Leveraging new detector technologies, such as the cesium-iodide panels, yields improvements in image quality at a lower dose. MR systems have become more open and comfortable to make such scans an increasingly viable alternative for some studies and to avoid utilizing ionizing radiation. Vendors who take dose reduction as seriously as White Memorial have proven invaluable to the initiative. For these reasons, going forward, White Memorial—and the Adventist Health System as a whole, of which White Memorial is a part—is weighing dose reduction capabilities much more heavily when choosing new imaging equipment. White Memorial’s new capital purchase analysis tool looks at price, dose reduction, upgradeability, clinical suitability, and user interface when assessing technology, with price and dose reduction as the two highest-weighted factors in the analysis. This applies to mammography as well; we currently are evaluating vendors’ mammography offerings to ensure that our women’s imaging is done in the safest and most effective manner possible. “Safety of the patient is paramount in our efforts to support early detection of breast cancer, and that entails that we perform the highest-quality examination at the lowest dose to the patient,” says Edward Gabriel, MD, medical director for advanced and women’s imaging at White Memorial. In the first three months of the program, White Memorial already has seen real improvement in adherence to dose reduction guidelines. Radiologists are more engaged with the hospital’s medical staff, helping to guide them to make more appropriate decisions when it comes to ordering images. Our orders for fluoroscopy studies, for example, average fewer than one per day, a sharp decrease from historical physician order patterns. Our technologists’ quality control numbers improved drastically at the first six-month audit after starting the program. While dose was always well attended in pediatric patients, between 2010 and 2012, sharp improvements were achieved in CT dose index volume measurements for patients under the age of 10. We have consistently been well below ACR-recommended values. Marketing this initiative and its results to patients is important in light of the fears regarding radiation dose from imaging that were ignited in the wake of incidents such as the Cedars-Sinai CT radiation overdose in 2009. We want to demonstrate to the patients that we, as providers, have their best interests in mind at all times. Patient satisfaction, a growing factor in reimbursement, relies in no small part on patients feeling safe. At White Memorial and the larger Adventist Health System, radiation dose reduction and monitoring will be part of a forthcoming marketing campaign that will let patients know we are concerned with dose as well. Further, in California and other states, recent legislation mandates that radiation dosage levels be recorded on scanned images and in patients’ health records and requires accreditation of all facilities conducting CT scans. We anticipate that this legislation is only the beginning. By getting ahead of state requirements, we can save costs down the line while providing the best possible patient care today. While state and federal entities undoubtedly are working toward the goal of lowering dose, it is our job as physicians, leaders, and technologists to make it happen with our patients’ best interests at the forefront of our efforts. The implementation of a radiation dose reduction and monitoring program requires ongoing education and reinforcement. While the approach may be “back to basics” in terms of physician ordering and technologist calibration, the attendant cultural change requires organizational commitment and an attitude that dose reduction is not the responsibility of one category of staff member or department but rather everyone’s responsibility. If the program is successful, the facility can expect it to pay dividends in terms of regulatory compliance, patient safety, and patient satisfaction. Doing so will continue to foster a more positive impression of radiology. — Timothy M. Gustafson, RT(R), is director of imaging services at White Memorial Medical Center in Los Angeles.